The panel Sort & Filter has been added, to which we have transferred control over the sorting and filtration of files. The panel displays filtration parameters, which extend the filtration over ratings/labels that we have in previous versions. Sorting: the sorting order can be changed on the fly, supporting all previous methods of sorting, plus sorting by XMP rating. 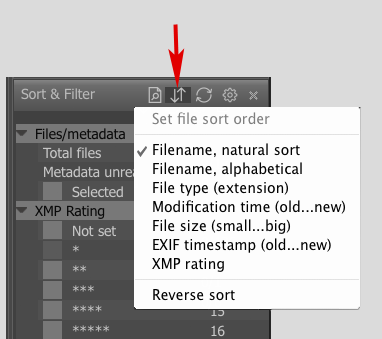 To sort by metadata, which needs to be read from the file (EXIF, XMP), the sorting occurs dynamically and is animated, corresponding to the reading of the current folder. Filtration is controlled by the rest of the new Sort & Filter panel: you can check the chechbox to the left of the sorting and filtering parameter, and only files that pass the filtering conditions will be displayed. 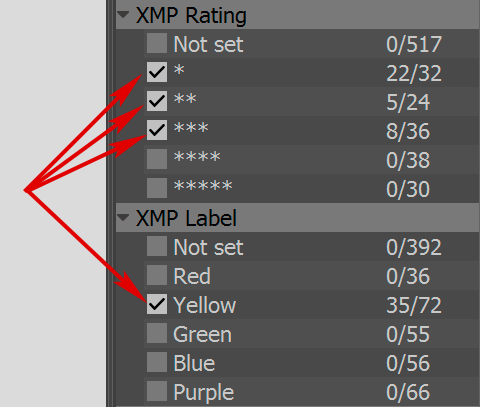 In XMP Rating/XMP Label groups, you can set the desired combination of ratings and labels. If there are any selected files in the folder, you can check the checkbox to the left of the word Selected, and only the selected files will be displayed. In this case, if you unselect some file, it will be excluded from the display, which means that in order to have it displayed again, you need to uncheck Selected and select the file again, after which you can check Selected once more. The filtration inside one group is OR-type. The filtration among groups is AND-type. That is, if, for example, you select XMP Label Yellow and XMP Label Green, files that have either of those two labels will be displayed. If, however, you checked "XMP Rating: 3, XMP Label: Green, and EXIF Timestamp: This week", only the files which conform to all three conditions simultaneously will be displayed. The numbers in the respective lines indicate how many files there are with a given parameter value. 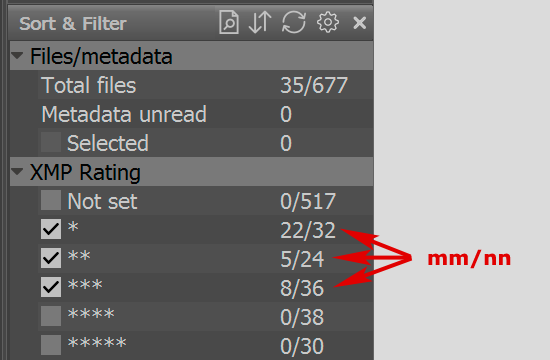 If the numbers are in the form nn/mm, mm indicates how many files with the given parameter value are present, while nn indicates how many of those passed through the filters. If only one number is indicated, then all of the files passed through the filters. If the numbers are displayed in italics, the reading of the metadata is still in progress. To save, cancel, and restore filters, use the new File - File filtering in folder submenu, or use the corresponding hotkeys. Disable/Enable file filtering (assigned to V by default) flips the status of filtration: if it’s On, it’s switched Off. The filtering conditions are temporarily stored so that when the filtering is re-enabled, the previous filtering conditions are automatically applied. Remember current file filter (assigned to Alt-V by default) - stores the filtering conditions in a non-volatile fashion. Recall saved file filter (Ctrl-V) – restores the non-volatile saved filter settings. If the setting File Handling - Reset filtering on folder change is On, Disable file filtering will be automatically triggered when the folder is changed while the filtration is On; the filter settings will be preserved and recallable through the V hotkey. Filtering by filename is switched on and off through Menu - File - File filtering in folder - Filter files by name (Alt-F) or the “page with magnifying glass” button, located in the Sort & Filter panel’s title bar. a regular expression in PCRE syntax; this is recognized by the / symbol in the first position of the edit line; this symbol will be ignored when evaluating a regular expression. 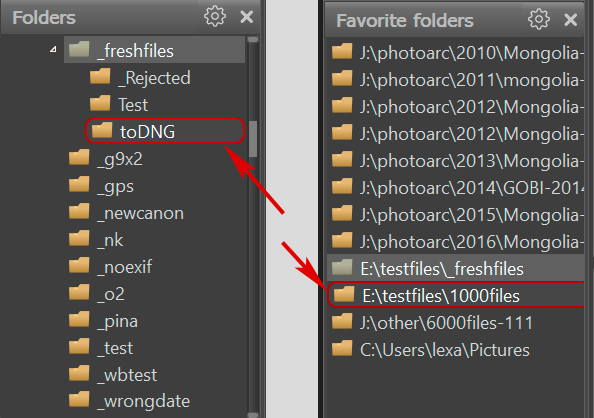 After pressing Enter (or the folder-with-magnifying-glass icon located to the right of the edit line), the files in the current folder will be filtered, i.e., only the names of the files that meet the condition in the edit line will be displayed. Any other present filtering conditions such as label/rating/date/etc., are also applied. Name filtering precedes metadata filtering. This filter isn’t cancelled/restored/saved/recalled by the Disable/Enable/Remember/Recall actions (see above) and isn’t switched off when moving to a different folder. Re-read current folder – the current folder will be re-read as if it has just been opened with Menu-File-Open folder (but the current file will still be displayed or highlighted). Forced full metadata read – the metadata of all files will be re-read (as if Lazy metadata read were turned off). Show Selected files – turns on the display of the Selected line in the current group. Show zero values for completely fetched data – if this setting is Off, then the table display the lines that do not don’t correspond to any of the files in the current folder. Display is only turned off when the metadata for all of the files in the folder has been read. Hide groups with only one value – if the corresponding group (XMP Rating, Label, EXIF Timestamp) contains the same data; in other words all of the files in the current folder fall into the same line in the group, the entire group will be hidden. The first have already been described above, however for the sake of completeness, we’ll list them here. Lazy metadata read – only reads metadata if it’s needed for sorting/filtering. Reset filtering on folder change/forced folder refresh – switches filtration if the current folder is changed. The filter will be stored and may be recalled by pressing V.
Scroll to selected image while filtering/metadata being read – if filtering and sorting occur simultaneously with metadata being read, files in Grid View and/or Filmstrip are constantly added and/or re-sorted. 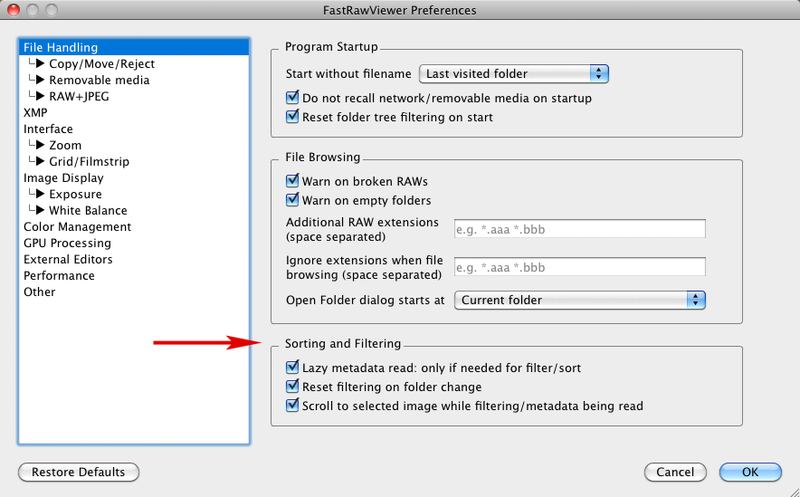 If this setting is On, the view will be automatically scrolled to the currently-selected file. This auto-scroll interferes with browsing through the images in the folder, but is useful if you want to keep the currently-selected file in view. 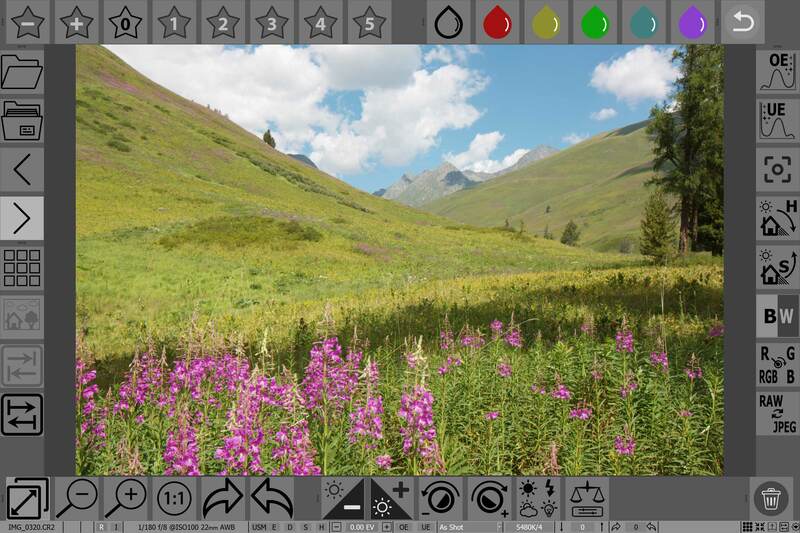 The FastRawViewer version for Windows 7-10 supports the Touchscreen interface. This support is disabled by default; one can enable it via Preferences – Touchscreen – Enable Touchscreen features. 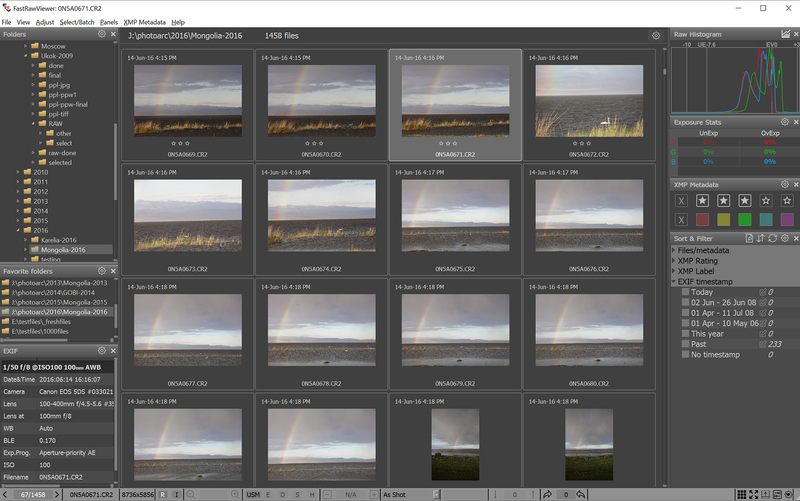 Toolbars for the main action: file navigation, interface mode switching, zoom, setting XMP ratings and labels, RAW data inspection, setting exposure compensation, contrast, and white balance. Support for basic gestures on the touchscreen. 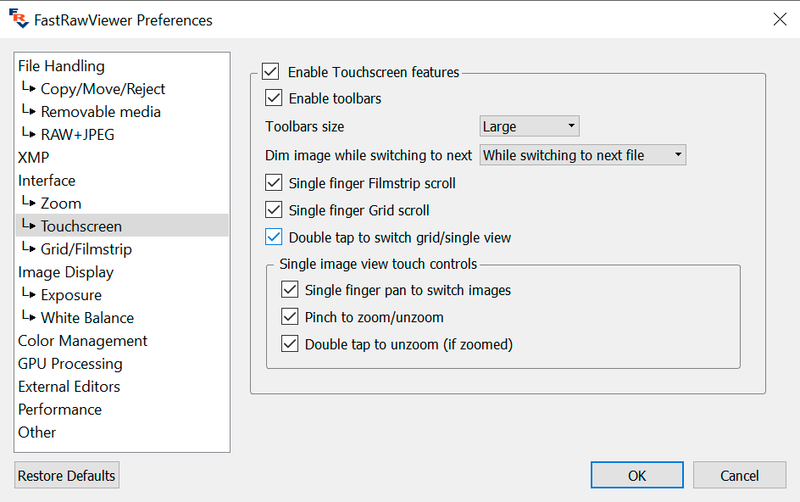 Enable toolbars, Toolbars size – switches Toolbars on, and allows one to adjust the size of the Toolbars. This gives visual feedback if working on a slower tablet to indicate that switching between images is in progress. While switching to next file – decreases the brightness by 40% while in the process of switching to another image. This is the default. 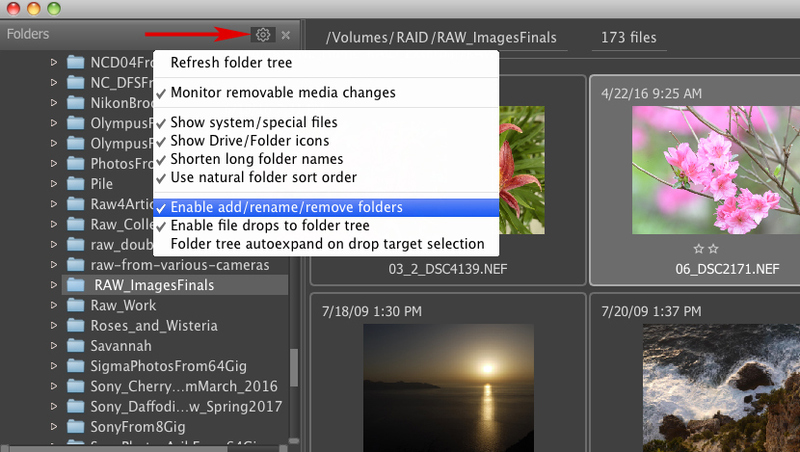 Next file or RAW/JPEG switch – the same as previous, plus a 25% decrease in brightness when switching between RAW and JPEG. Single finger filmstrip scroll/grid scroll – the scroll is performed with a single figure gesture. Double tap to switch grid/single mode – switches between Grid Mode and displaying a Single File with a double-tap. Single finger pan to switch – allows one to switch images with one finger gesture (from left to right). If the zoom is larger than Fit to Screen, instead of switching images the current image is scrolled. Pinch to zoom/unzoom – change the zoom level of the image with a pinch. Double tap to unzoom (if zoomed): if the image zoom level is larger than Fit to Screen, a double-tap will bring it to Fit to Screen. If Double tab to switch grid/single mode is turned on, another double tap will return to Grid Mode. The Folder panel settings now contain a setting to Enable add/rename/remove folders. Create subfolder – creates a new folder and immediately suggests renaming it to something sensible. Rename folder – allows one to rename a folder. If a folder is currently in use by some other application, renaming or deleting it may not be possible; in this case, an appropriate message will be displayed. In Grid/Filmstrip Mode: If a selected file is dragged, then all selected files will be dragged to the same destination. In Grid/Filmstrip Mode: if a non-selected file is dragged, only that file will be dragged. The standard scroll action is assigned by the zoom level as such that the image is displayed fully in the window. Drag and Drop from Grid/Filmstrip/Single View to the folder tree (Folders and Favorite folders panels) is switched on by default, but can be disabled if the checkbox for Enable file drops to folder tree is turned off in the settings for the Folders panel [gear icon]). 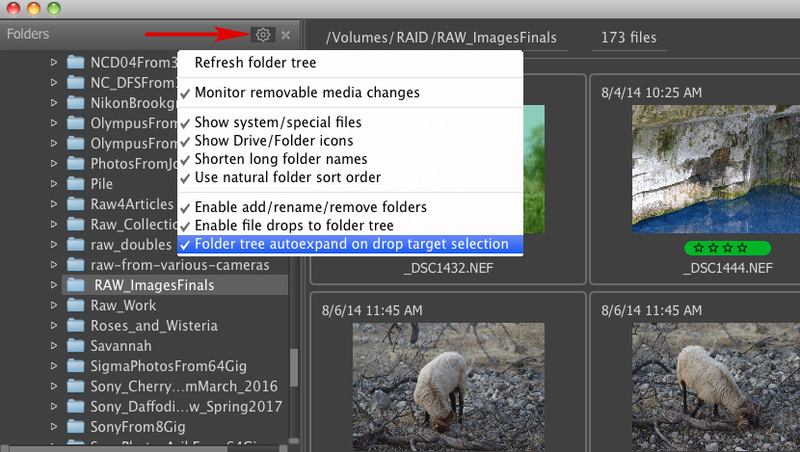 It is also the place where you can switch on Folder tree auto-expand on drop target selection – in this case, the folders will be automatically expanded when you drag a file to it. The folder which is currently under the drop cursor is automatically highlighted in red. You can not only drop files into the Folders panel, but also into the Favorite Folders panel. Copy w/o prompt – the file is copied; no user confirmation is requested. Select copy or move – at each drop action, the user will be promoted to select what to do with the file (copy, move, cancel the action). Move files – the files will be moved, and the request for confirmation is set by the Confirm file move checkbox in the same Copy/Move/Reject pane. Settings Copy/Move/Reject - Remember drop targets in last used copy/move lists affects adding the folder that was the target for the drop operation to the lists of Copy/Move to ... last used folder. 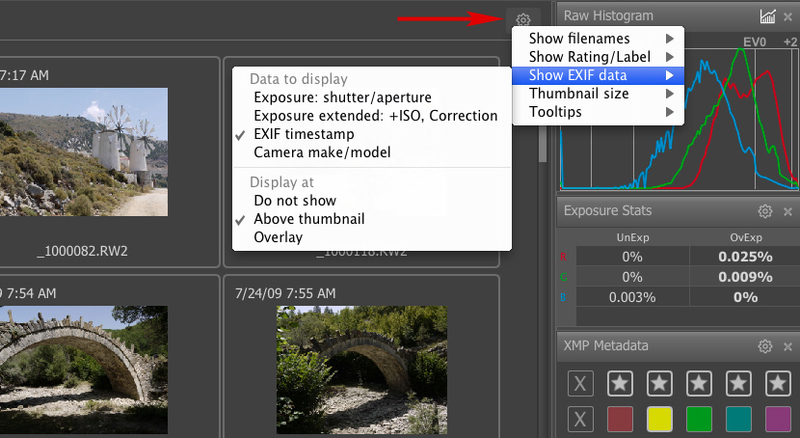 The setting XMP - Read rating/label from embedded XMP blocks is obsolete and has to be removed: FastRawViewer will now always read XMP blocks in the framework of reading EXIF information. 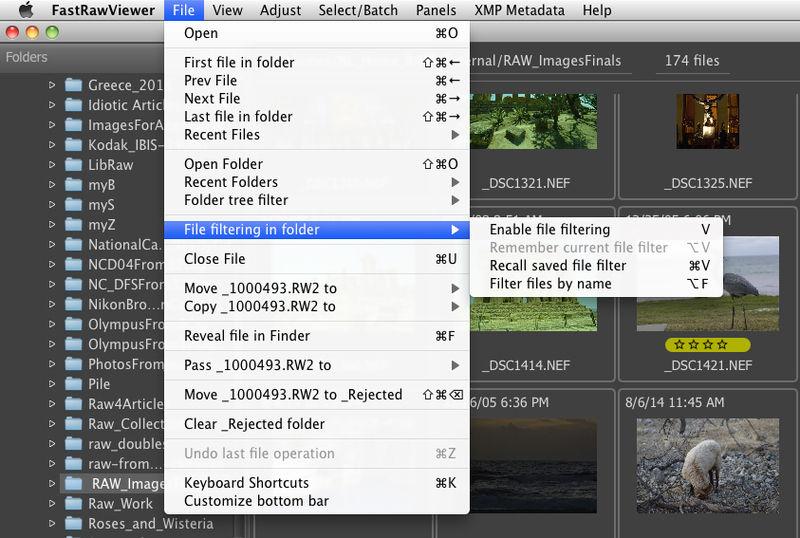 New setting XMP - Write XMP blocks into JPEG files instead of creating sidecars. This setting is added because certain programs (for example, Adobe Bridge) ignore XMP sidecars for JPEG files. To put XMP blocks into JPEG files, we use Adobe XMP Toolkit. Since we can’t be 100% sure as to the reliability of the said Toolkit, we issue a warning when this mode is switched on. If this option is used, and the XMP sidecar file for a given JPEG file is present, it will be deleted after the XMP block is recorded inside the JPEG file. 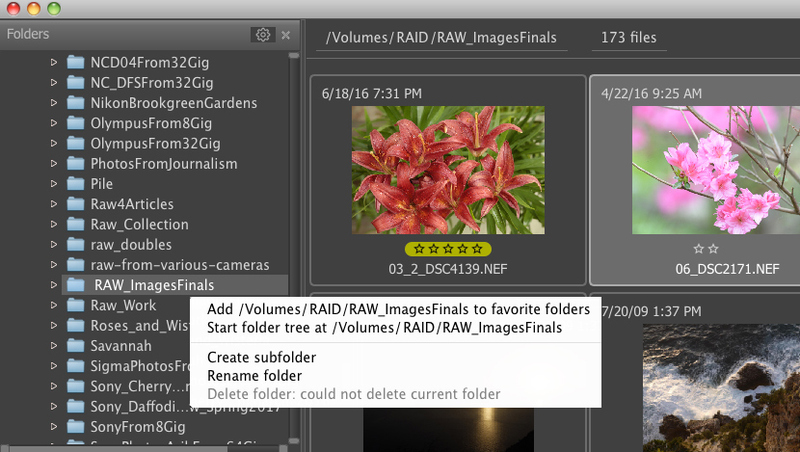 Adobe Camera Raw/Lr – if this mode is selected, the information from the tags in Adobe format will be used. 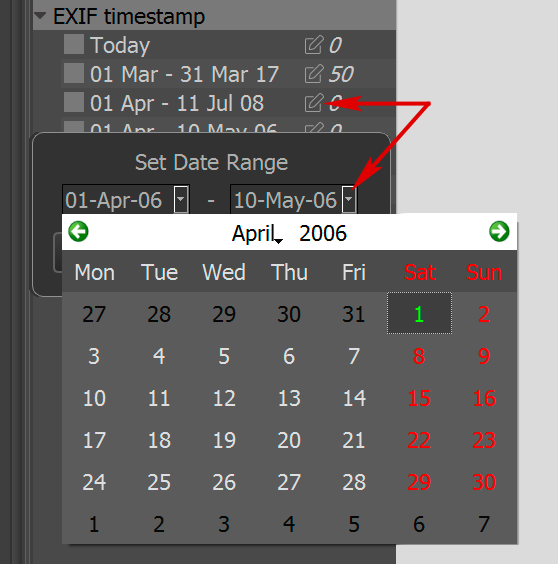 Flexible – check the date of the tags and use the most current. To use the “Flexible” option, only XMP files recorded by FRV 1.4.0-1091 and later can be used, because the previous versions did not timestamp the FRV tags. If “Flexible” is selected but the XMP files are from the previous FastRawViewer versions, the FRV mode listed above will be used to maintain compatibility. FastRawViewer versions prior to 1.4 had a setting similar to the FastRawViewer mode above. FRV was recording tags in both FastRawViewer and Adobe formats; FastRawViewer tags use a Libraw prefix and if those tags were present in an XMP file, they were given priority. As a result of this behavior, if a RAW file was later edited in an Adobe program, the changes were not visible to FastRawVIewer. New settings allow one to account for the changes made in Adobe programs even after the initial editing of the settings in FRV. 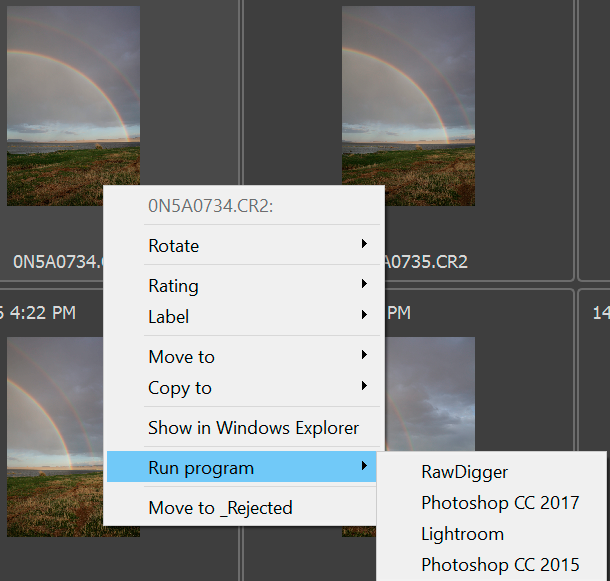 Adobe Camera Raw/Lr mode will work normally with XMP files created in previous versions of FRV if the recording of Adobe tags was on. Flexible mode is intended for the files starting with FRV 1.4; in this mode, the most results of the most recent editing session will be used. In the current version, FRV 1.4, the default for this remains as FastRawViewer mode, in order to maintain compatibility with previous versions. New hidden setting AllowRotationWOXMP, which is switched on and off via the scripts EnableRotationWithoutXMP / DisableRotationWithoutXMP (take effect after the program restarts). If the setting is on, the rotation of the image in Fullscreen mode will work, but this rotation will not be recorded, and doesn’t affect the preview in the Filmstrip/Grid. Bugfix: if XMP recording was switched off, the context menu for file(s) displayed actions with XMP (orientation, label, rating). This was not recorded into XMP. 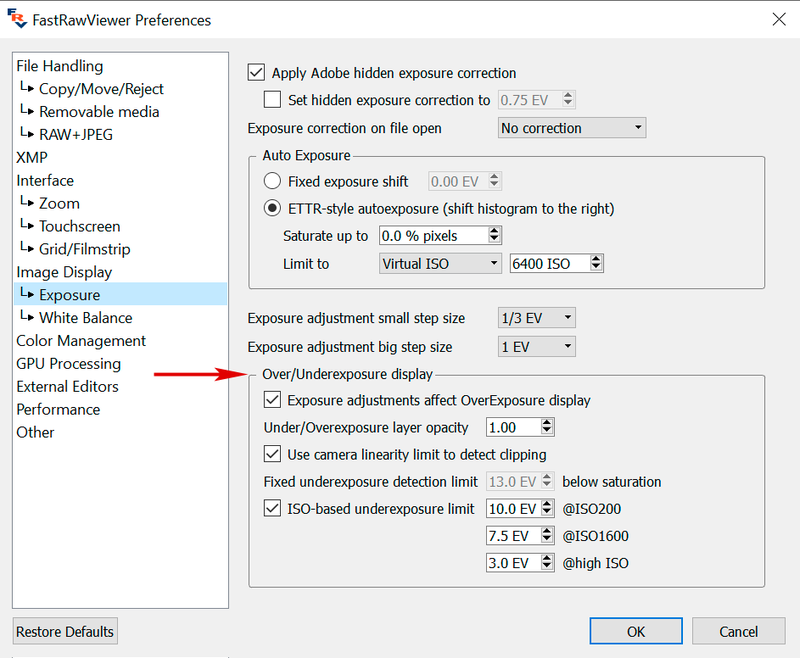 The setting XMP - Write Adobe Contrast now depends on the common setting for the group Write Adobe Compatible WB/Exposure/Contrast: if the group is off, then no Adobe processing tags are recorded. The new setting XMP - ratings/labels - Visual Feedback on rating/label change - switches on visual feedback while setting ratings/labels (similar to how it is done in Adobe Lightroom) in Grid and Single Image modes. By default, this is off. When ratings or labels are set through the context menu or assigned to a group, the visual feedback is not displayed. EXIF is now displayed in Grid Mode without any additional user actions. Correspondingly, the icon for Stats reading has been relocated to the Histogram panel and controls both the histogram and the statistics in Grid mode. Upon the first start the date that the shot was taken will be displayed in Grid mode and nothing will be displayed in Filmstrip. The settings for Exif data display are accessible through the “gear icon” separately for the Grid and Filmstrip modes. While parsing EXIF timestamps, both EXIF and ISO 8601 standards are supported. EXIF display in GRID mode: if a RAW file has no EXIF data, an attempt will be made to extract EXIF from the JPEG preview. EXIF: it is now possible to display Flash Exposure Compensation (by default, this display is off). New setting: Exposure - Use camera linearity limit to detect clipping. If this setting is on, and the camera records the linearity limit in one of the known EXIF tags, overexposure will be indicated for the areas where the pixel values are greater than this limit; overexposure statistics will also be calculated using this limit. The setting Exposure - ISO-based underexposure limit allows one to control the calculation and display of underexposure using three parameters for Underexposure limit for ISO200, for ISO1600, and for higher ISO settings. The calculation of the Underexposure limit is performed as follows. For ISO values of 1600 and lower, down to ISO 6, the linear change is such that the line passes through the value for ISO200. In other words, the line passes through two points: ISO1600 and ISO200. The = "-5" mark finally corresponds to our initial design: it shows the cutoff for underexposure warnings and can now take the form, for example, US-4.7. When the value differs from an integer by less than 1/6th, it’s rounded to the integer (4.15->4). Other values are rounded to one decimal place. As a result, when exposure correction is changed, the marks EV0/EV+3(+2) are moved, following the new positions of midtones and highlights while the underexposure mark stays, as exposure correction in RAW conversion doesn’t improve the noise in the shadows. 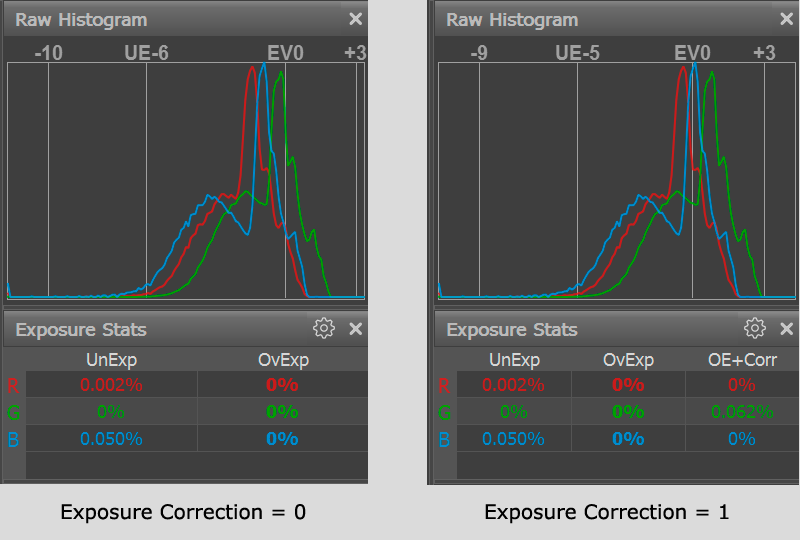 However, the value for the underexposure mark will be changed because it is now calculated down from the new position of the midtone EV0 (please see the examples here: one with an exposure correction of 0.0, and the other with a correction of +1EV and the third column OE+Corr, which indicates the percentage of pixels that will be blown out if such a correction is applied). New setting Preferences - External Editors - Set custom name. A custom name can be set for each of the external program that you will be using from FRV. This allows one to create customized names for each of the programs listed in the External Editors pane. This is useful when using several programs with the same name, like two different versions of Adobe Photoshop, with the user wanting to easily distinguish between them. As soon as those custom names are provided, they will be displayed in Menu – File – Pass filename to and context menus. Clicking on the GPS coordinate in the EXIF data will open Google Maps in your default browser and drop a pin in said GPS coordinate. The processing of DNG tag PreviewColorSpace has been added. The current folder and the number files (total, displayed, and selected) in it is now displayed above the Grid panel on the same line as the Settings “gear” icon. The processing of damaged files has been improved. The brightness of the preview is increased in such a way that this 1% of the image is clipped; however, the increase is limited to 6EV. If the brightness is to be increased by more than 3EV, the midtones are also brightened through an additional gamma curve with gamma 1.6. If the calculated brightening is less than 1.5EV, no brightening is applied. New setting File Handling - Copy/Move/Reject - Verify file contents after copy: the file resulting from Copy/Move/Reject operation is compared with the original. If the comparison fails, a warning is displayed and the file resulting from the operation is deleted, as it’s obviously damaged. The tone curve is set to sRGB (regardless of the settings for the Contrast curve), contrast editing is switched off. The color transform is calculated from the ColorMatrix DNG tag, any make/model-specific color profiles are ignored. White Balance is extracted from XMP-data; if the XMP-data doesn’t contain White Balance, it’s set to UniWB. During the reading of the file list, apart from the standard delay (FileArrivalDelay, 2 seconds by default), we also check the file size and file modification time. To prevent attempts to display incomplete files that are on their way to the disc drive, a new file will be displayed in the folder only if its size/modification time hasn’t been changed over two consequent checks. Renamed setting Performance - Re-read folder each nn sec to Check for folder updates each nn sec. 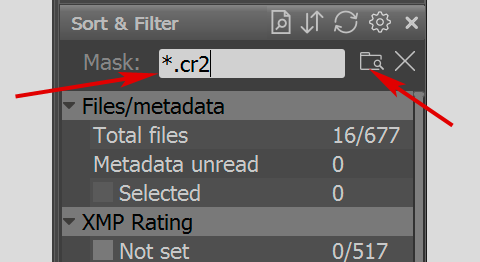 Such a name is more to the point because it doesn’t force re-reading of the folder; what is actually set is the time between checking the system folder changed notification (NB: for Network/Removable media, we have separate settings ‘Monitor folder changes’ in FastRawViewer Preferences - File Handling - Removable media); by default, the monitoring of Network and Removable Media is. When the program was started with the histogram panel switched off, the window for the histogram had the wrong size at the first display.